Dance Passion offers group ballroom classes for beginners at our Studio located at 6626 Central Avenue in St Petersburg. These classes are designed for people with limited dance experience, or even no dance experience at all. We teach basic, easy-to-remember routines which you can use to navigate any social or party dance floor. You don’t need a partner nor any previous dance experience. These group classes are meant to give you a taste of different dance styles, such as Swing, Salsa, Foxtrot and Tango. 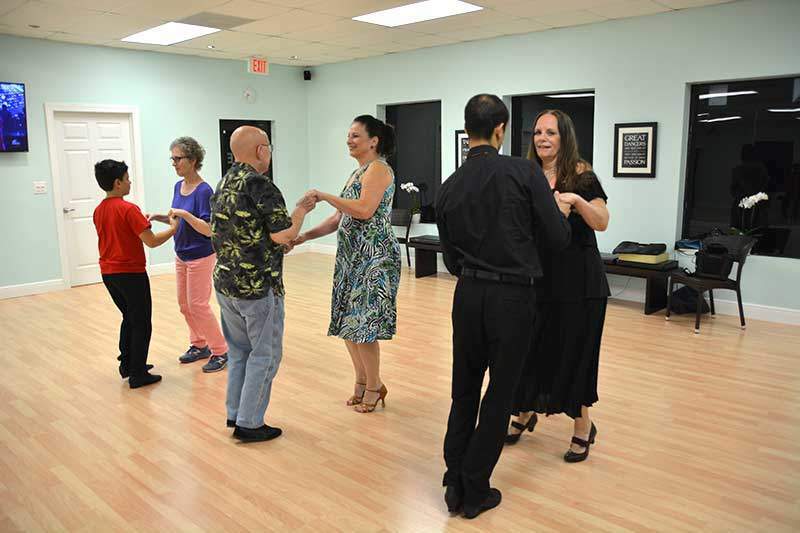 They are a wonderful way to get acquainted with the world of ballroom dancing and our Studio. We encourage rotating partners during the group class. That way, you get to practice leading and following with different partners. So, feel free to come by yourself, with a partner or friends. It’s a great way to meet new people or spend time with friends while learning something fun! Group class is an inexpensive means to learn new figures and patterns. Dancing improves your balance, strength, flexibility, and stamina. We offer group classes Monday to Friday covering various dances. Group class enables you to dance comfortably on any social or party floor. Group class allows your lead and follow to be predictable through repetition. You do not need to sign up for group class in advance. Group class gives participants practice leading/following different partners. Group class increases your balance and your sensitivity to your partners’ balance. Meet new friends in group class and dance with new people in a structured environment.